The Barrhaven Children’s Softball league uses this page to capture materials and resources that may be useful to players, parents and coaches. 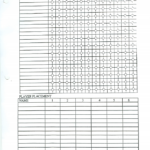 One of our coaches has created a new PDF blank scoresheet for the league. The old version is still available for historical reasons.